Michelle Stevens is a pianist, and Heather Lawson is a performer. Together, they’re putting on a live art experience that aims to evoke empathy and provoke reflection on the way we navigate the world. Both artists are also deafblind. 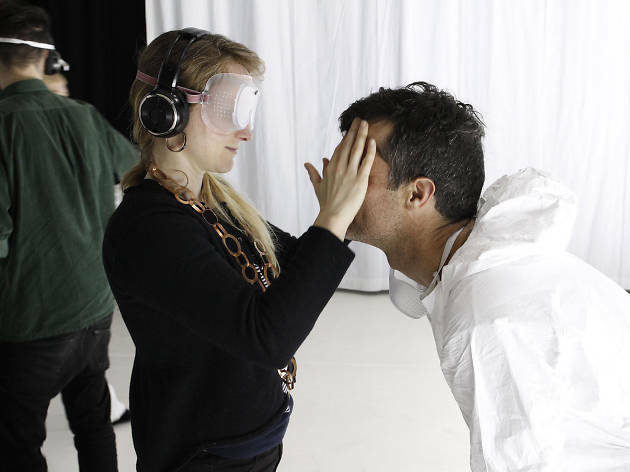 Imagined Touch: the deafblind art experience is an immersive part-installation, part-theatre piece in which sight and sound give way to other sensory experiences. It’s the result of more than three years of workshops and audience testing, with artistic director Jodee Mundy at the helm. It is estimated that approximately 300,000 Australians are deafblind. For these individuals, the primary form of communication is through signing into the hand – a tactile sign language known as haptics. On entering Imagined Touch, audiences must surrender their sight and hearing, put their trust in the hands of Stevens and Lawson. At times, audiences are left alone – a reflection of the isolation many deafblind people feel in a world in which the majority of people do not use touch to communicate. At other times, audience members are touched, and the realisation hits that they’re being spoken to in a language they don’t understand. For taste of Imagined Touch, watch the video below.